Keringten Martin secures back points in a dual with Versailles. 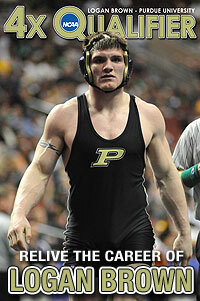 Gavin McReynolds battles at 182 pounds. 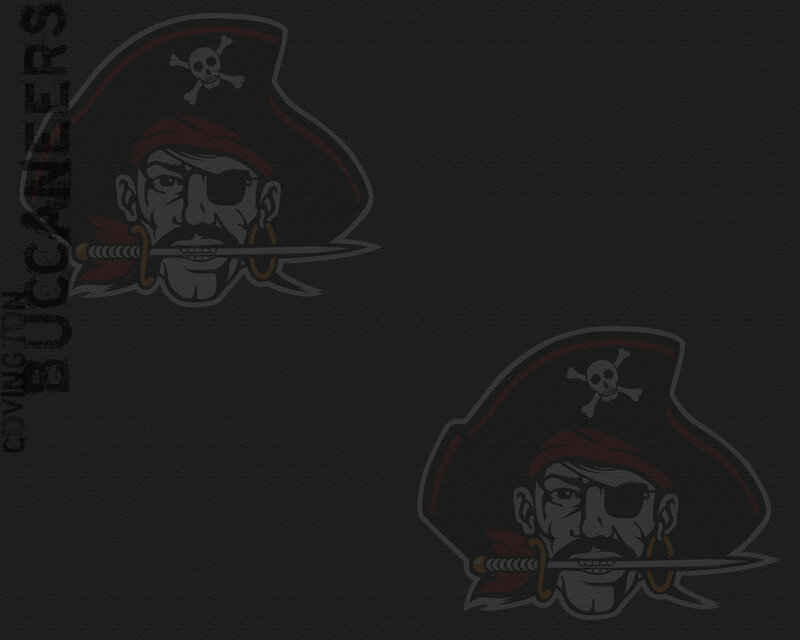 Buccaneer freshman Duncan Cooper picks up a pin at 160 pounds. The Versailles and Covington wrestling programs - along with Miami East - are traditionally some of the stronger D-III programs in Southwest Ohio. And this year looks to be no exception. 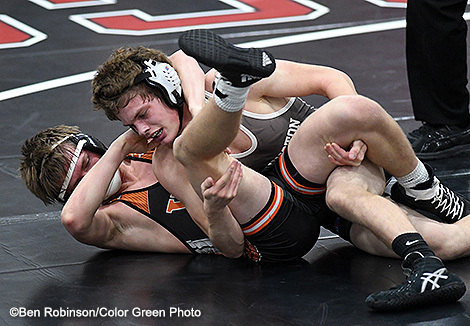 The Tigers and the Buccs got together for a dual at Covington High School and Versailles led from the start in a 46-22 victory. "Any time you come to Covington, you have to come ready to wrestle," Versailles coach AJ Bey said. "We graduated a number of quality kids. We have some young guys out there. I am sure we will take some lumps early, but we will be fine by the end of the season." There was no sign of taking any lumps Tuesday. "Versailles has a great wrestling program," Covington coach Eric Vanderhorst said. "Congratulations to them. You know it is going to be a tough match when you wrestle Versailles. There are always going to be a lot of back-and-forth matches and there were tonight." The match started at 120 pounds and Versailles won four of the first five matches to take a 19-3 lead. At 120 pounds, Jake Poling pinned Taylor Viney in 1:51. Cael Bey (126) recorded a 4-2 win over Riley Richards in a battle to the end, while Preston Platfoot (132) recorded a 14-6 major decision over Kyle Barga. Kyle Wuebker (145) added a pin of Fletcher Metz in 2:09. "We talk about that all the time - getting on a roll early," Bey said. "Wrestling is thought of as an individual sport - but there is a team aspect to it." Covington's lone win in that stretch was the most dramatic of the night. 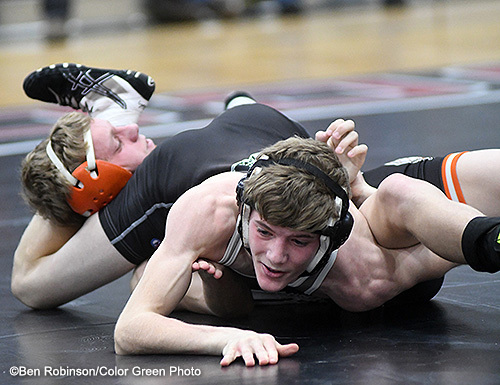 At 138 pounds, Versailles' Nathan Wagner had a takedown with 32 seconds to go to lead Austin Flick of Covington 8-7. But, Flick was able to get an escape in the closing seconds and get a takedown in overtime for a 10-8 win. "That was a match that could have gone either way," Vanderhorst said. "That was all heart on Austin's (Flick) part in that match. That was a good win." Covington would then get back-to-back pins by Kerringten Martin (152) in 2:39 over Dalton Didier; and by Duncan Cooper (160) in 3:11 over Noah Gilmore to get the Buccs within 19-15. Versailles would then win the next five matches to seal the victory. Derek Cavin (170) won by forfeit and Tyler Gigandet (182) held off Gavin McReynolds 3-1. The Tigers followed that with three straight pins. Isaac Grilliot (195) pinned Joseph Franke in 3:40; Austin Nerderman (220) pinned Dylan Staudt in 1:31; and Jeffrey Ware (285) pinned Bryce Keiser in 1:36. Covington would then close by winning the final two matches. Kellan Anderson (106) led 5-2 going to the third period and held on for a 6-5 win despite a late takedown by Kobe Epperly; and Cael Vanderhorst (113) recorded a 16-3 major decision over Trevor Huber. 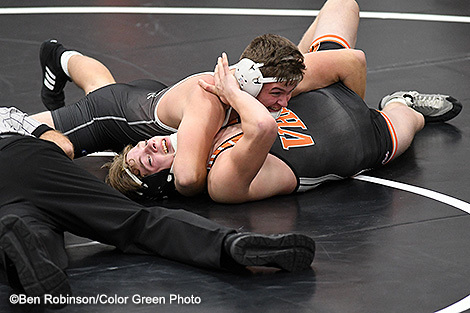 In JV matches, Versailles got wins by pins from Nick Monnier (126) and Louden Keighl (285), while Covington's Deacon Shields (145) recorded two pins and Bryce Smith (138) won by pin. 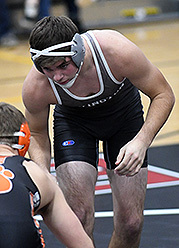 "It was a good finish (to the varsity match)," Vanderhorst said. "We had some good wins and in our losses, we learned some things. And we had some nice wins in JV matches." 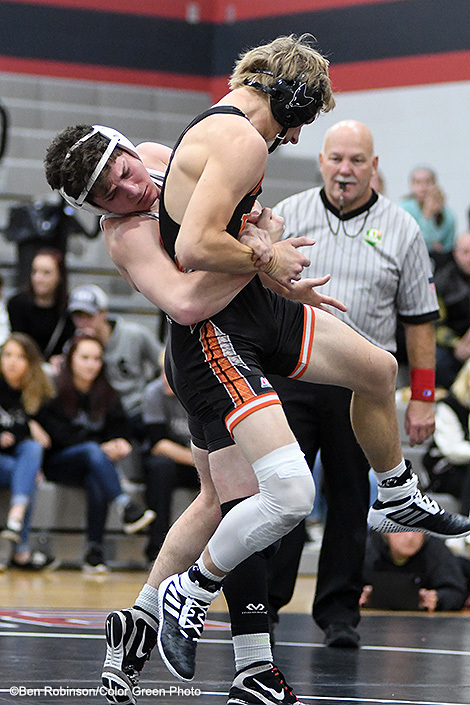 While Covington is off until the Versailles Invitational Dec. 16, the Tigers will continue their challenging schedule with a trip to Centerville Thursday for a tri-match. Austin Flick finishes a takedown to win in overtime at 138 pounds. Kyle Barga lifts his opponent in a takedown attempt in an exciting dual against Versailles.